EFC Group provides standard & bespoke hydraulic control and hot line panels. These are multi-purpose units for control and testing any hydraulic actuated equipment. High and Low Pressure test units are provided by EFC Group. 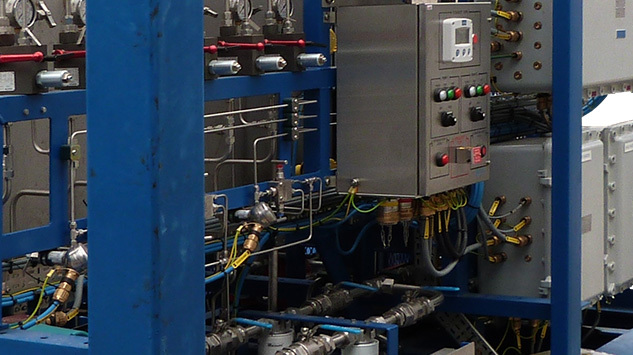 Whether they are bespoke or standard the Pressure Test Unit is designed to pressure test critical Well Control Assemblies. Our HPUs provide a clean, stable supply of Hydraulic fluid to either topside or subsea equipment. Our systems are manufactured in accordance with client determined specifications. Pressure Regulator Regulator Maintains Constant Flow Rate Despite Variable Pressure Adjustable Set Point for Pressure, Multiple Regulated Lines Available. Interested in Jack-Up BOP HPU? Required flow rates and operating pressure, including swept volumes to open and close. Is the unit to be API 16D Compliant or another standard.